Recently Møller, Pettitt, Berthelsen and Reeves  introduced a new MCMC methodology for drawing samples from a posterior distribution when the likelihood function is only specified up to a normalising constant. We illustrate the method in the setting of Bayesian inference for Markov point processes; more specifically we consider a likelihood function given by a Strauss point process with priors imposed on the unknown parameters. The method relies on introducing an auxiliary variable specified by a normalised density which approximates the likelihood well. For the Strauss point process we use a partially ordered Markov point process as the auxiliary variable. 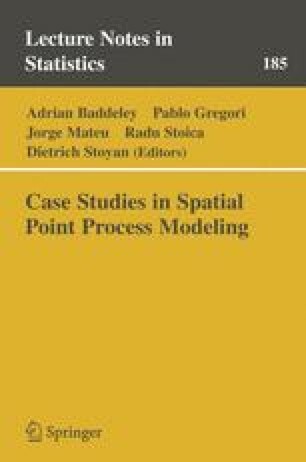 As the method requires simulation from the “unknown” likelihood, perfect simulation algorithms for spatial point processes become useful.